SLG Construction provides the full spectrum of general contracting and construction management services. Our primary area of operation is the five boroughs of New York City. 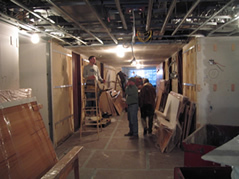 We have also completed projects in New Jersey, Westchester, and Long Island. We constantly focus on giving our clients the most value for their construction dollar. This requires a special emphasis on pre-construction. It is before the project starts that the end will be determined. Our staff is highly skilled and experienced in estimating, budgeting, and scheduling. Value engineering, constructability reviews, as well as setting up the ‘critical documents’ paperwork are just some of the many things we also do to make a job run smoothly. Though the following trades are subcontracted, they remain under SLG management before and during their portion of the work, and their product is our responsibility. In our experience, every project gets done. The question is, how it will get done. Honesty, fairness, and transparency are hallmarks of SLG Construction’s relationships with its clients. These are requirements for not only completing a job, but doing so in a way that honors our founding principles and creates repeat customers, the truest measure of success.